Do you have ideas how we can help keep our community clean, green, and a beautiful place to live? Are you looking for ways to get more involved in cleanup efforts or to spread the word about proper recycling practices? If so, then you have come to the right place! Join the movement and help support cleanup campaigns, education, litter prevention, and beautification initiatives. 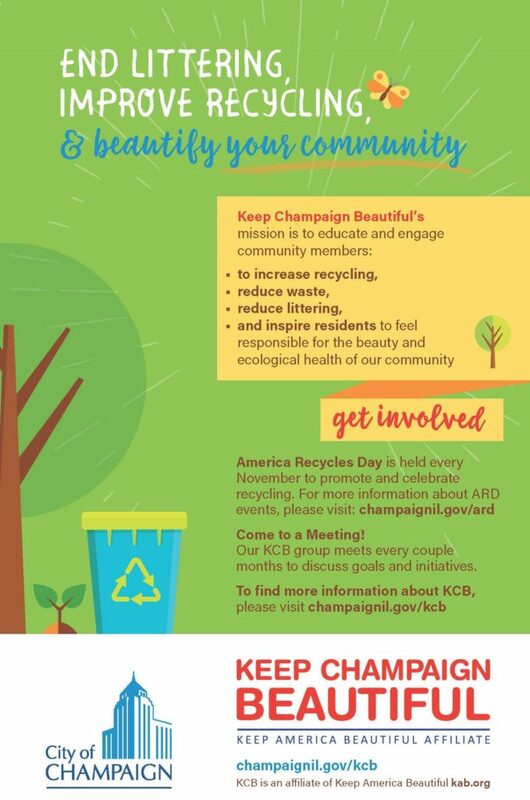 This event is a way to engage community volunteers to pitch in and clean up litter in Champaign. This event helps remind us all to be responsible citizens and to put trash and recycling in their proper place. Click here for more details about America Recyles Day.